Choose from a wide selection of quality mink, silk and cashmere lashes. We can advise what type of eyelash extensions will best suit you to achieve the result you desire. Ultra-fine lash extensions of varying lengths are used on the natural eyelashes to disguise gaps and give a light, natural feathering effect. This technique involves layering multiple lightweight lashes together to give a full volume, glamorous look with that is still soft and fluffy. Try these beautifully curled lash extensions for a more dramatic high impact design that is both striking and comfortable to wear. We use leading eyelash extension brands that have developed award winning products to the highest standards, combining softness with durability and strength. The extensions are designed to imitate natural lashes leaving you with a flawless look and perfect results. Extend your beauty. Longer, thicker, more beautiful-looking eyelashes frame and enhance your natural eye shape. This is the most popular treatment to lengthen and thicken eyelashes. Try our long lasting waterproof mink or silk individual 1:1 semi-permanent eyelash extensions. We will apply a beautiful set of lashes that will be perfect for special occasions yet suitable for every day wear. A full set of lashes will usually last 4-6 weeks. A common misconception is the extra full set wont look natural, but the shape and style is determined by the type of lashes applied, which you decide before the treatment. The result will be fuller and since more lashes can be applied with the additional treatment time, an extra full set of eyelash extensions will usually last 6-8 weeks. TRY OUR SOFT WEIGHTLESS LUXURIOUS CASHMERE EYELASH EXTENSIONS. 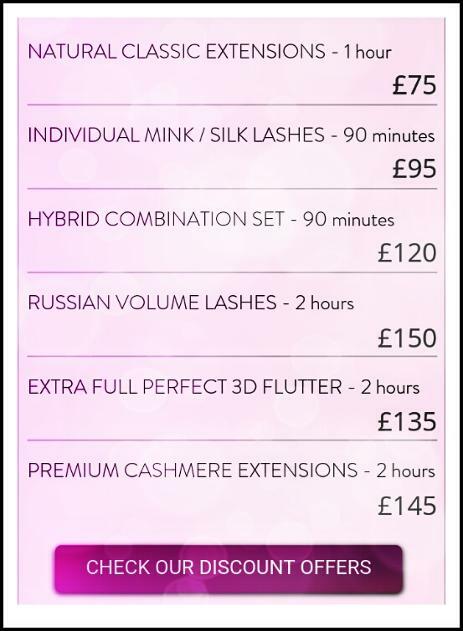 These luxury semi-permanent individual eyelash extensions have a unique radiant shine, and are a fraction of the weight of normal lashes so feel much softer than 0.07mm extensions. With better curl retention these luscious lashes will add glamour to your eyes. Find out why cashmere lashes are the softest, lightest, glossiest extensions on the market. 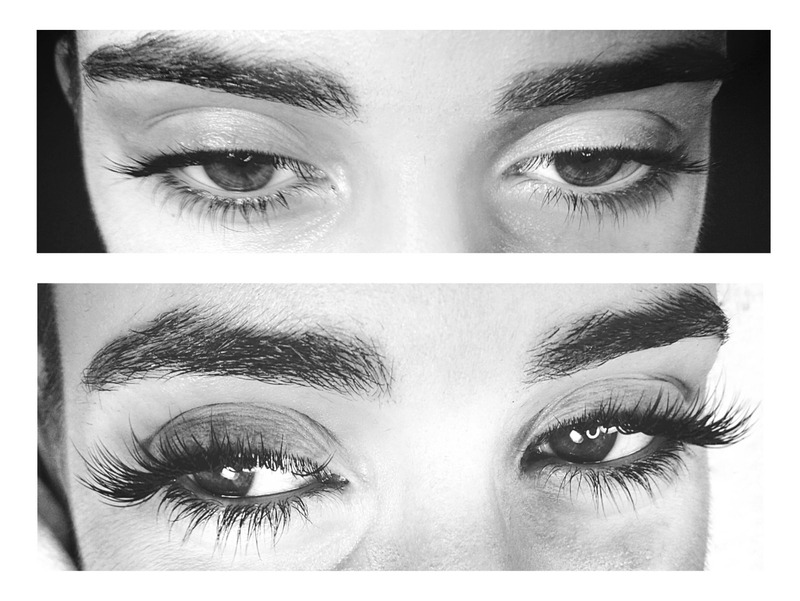 Individual lash extensions are applied within a shorter treatment time to achieve a natural mascara look. You can choose the length, thickness and curl of the extensions to suit your style and individual preference. There are less lashes applied so the extensions will generally last between 3-4 weeks. If you already have eyelash extensions but need a top up to regain fullness, we offer refill treatments to suit your requirements. The half set is a good choice for first timers who have never tried extensions or clients who just like to enhance the corner flicks with the lashes concentrated between the middle and outer edge of the eyes. Eyelash extensions can be removed safely using a de-bonding gel that loosens the adhesive glue on the lashes. This is a quick and painless process. There is no need to remove our lash extensions - you can allow them to shed naturally with your own eyelashes. 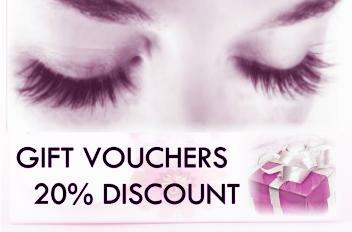 West London Lashes offers a comfortable and convenient mobile beauty service you can trust. Select your preferred appointment date and time online now. You can submit a booking request without making payment to hold the slot. This product can be applied after eyelash extensions, lash lifting or tinting treatments. It contains proteins and amino acids which help repair, restore and nourish the lashes. 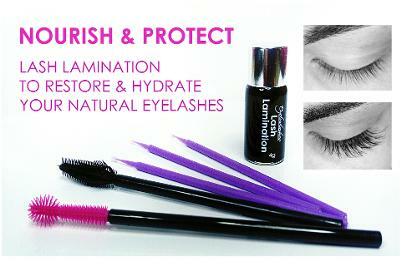 Its nourishing benefits help repair any damage/dehydration caused to the lashes from the perming/fixing lotions. In addition to its nourishing benefit it also acts as a sealant by applying a thin black coating which helps protect the lashes from moisture, humidity and oils. A further benefit is that the black coating tints the natural lash giving a nice shiny gloss finish which will last for a few days and can be removed using oil free make up remover. £10 EXTRA or FOLLOW US ON SOCIAL MEDIA TO TRY FREE.